Mary Anne Mowchan (Sister Susanne), a Sister of the Order of Precious Blood, departed to be with her Divine Spouse and Saviour on Tuesday, 27 November 2018 at St. Paul’s Hospital in Saskatoon, Saskatchewan, Canada. Seventy-seven years young, Sister Susanne was born on 07 January 1941 in Chesterfield, Pennsylvania and was a 1958 graduate of Moshannon Valley High School. Since taking her vows as an Adorer on 01 July 1961 in Columbia, Pennsylvania, Sister Susanne had devoted 57 years of her life to God through prayer and selfless acts of kindness and charity. 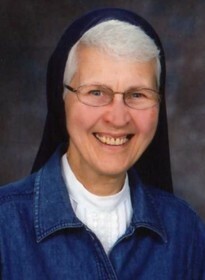 From 1975 to 1998 she resided at St. Peter’s Abbey in Muenster, Saskatchewan, Canada. In 1978, she was accepted to stay indefinitely as one of six Hermitesses at the Abbey. In recognition of her vow of poverty and devotion to prayer, Sister Susanne received the Solemn Consecration of a Virgin in 1979. After 23 years at the Abbey, Sister Susanne moved to Saskatoon in 1999 where she continued to serve others in prayer through 2018. Sister Susanne was preceded in death by her parents Michael and Susan Mowchan, brothers Joseph and Michael, and her sister Dorothy. She is survived by her brother Walter (Lefty) of Aberdeen, Maryland, John of Hesston, Pennsylvania, and Ray of Madison, Virginia. A Divine Liturgy will be held 11 AM Wednesday at St. Mary Ukrainian Catholic Church, Ramey, the church that she was baptised. Father James Davidson will officiate. Burial will take place adjacent to her parents at the Ukrainian Catholic Cemetery in Ramey.